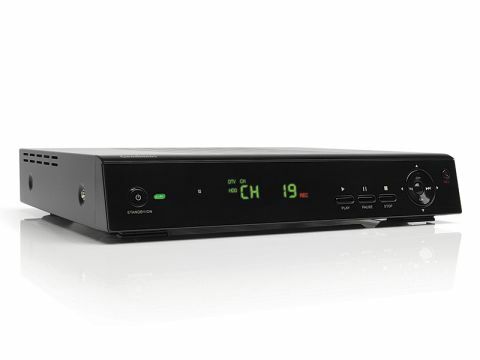 For what is a 'budget' Freeview Playback PVR, the GHD2521F2 looks surprisingly upmarket, with its mirror-finish, sensible array of front-panel controls and green LED channel display. It's dual-tuner, so you can record one channel while viewing another; a generous 250GB of hard-drive capacity, meanwhile, accommodates up to 120 hours of your favourite TV and radio shows. As an affordable solution, the GHD2521F2 stops short of HDMI; however, an RGB Scart output gives you the next best thing. A second (composite-only) Scart has been provided for a VCR – remember those? AV performance surpasses expectations, with RGB pictures that are sharp, clean and vivid in colour; sound quality, through both the analogue and coaxial-digital outputs, does full justice to what the broadcasters can deliver. Simple installation, easy to use. Because the GHD2521F2 records the channel's digital transport streams, a recording looks and sounds just as good as the original broadcast. Subtitles/alternative soundtracks are retained by recordings. Freeview Playback certification means SeriesLink, Pause Live TV, etc. The lack of an S-video output may displease those using DVD recorders without RGB Scart input, or older TV's whose sole RGB input is already connected to a DVD player. You may be able to pause live TV, but the contents of this timeshift buffer can't be 'saved' permanently if you decide the show is worth keeping.